Grading Coins - CoinGrading.com; Welcome! Over twenty years ago, I felt a burning need to help clarify a controversial topic. So I wrote How to Grade U.S. 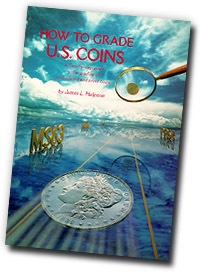 Coins, which I think helped demystify the process of grading uncirculated and proof coins. It received some acclaim within the numismatic field, although today, as a more seasoned writer, I cringe at the quality of my prose. Times have changed, but the need to educate oneself in the field of coin grading remains. I've decided to provide electronic access to this reference through the Internet...free of charge. No hate-mail from science fiction fans, English teachers, or professional editors please. It's the information that matters, right? Simply click on the hyperlink above or the book cover at right to begin reading.